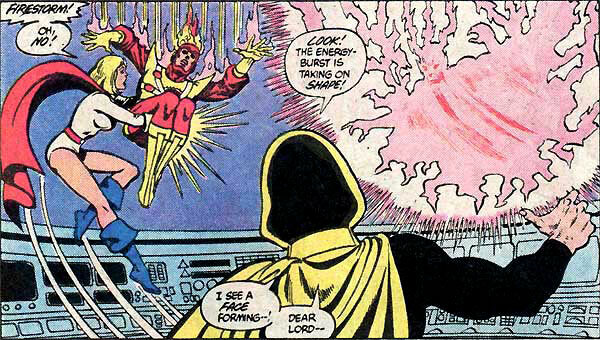 Believe it or not, Firestorm and Power Girl once had a romantic thing for each other! 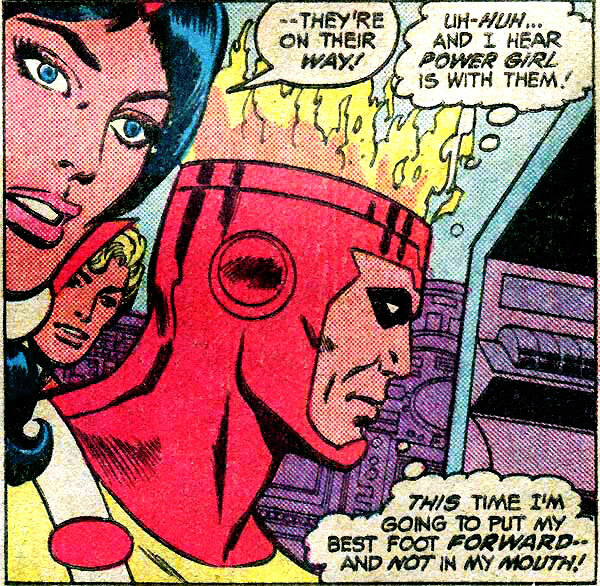 Our favorite Nuclear Man and one of the universally-accepted hotties of the DC Universe — good on Firestorm! Their flirtations continued from 1980 through 1983. Whenever the JLA (from Earth-1) and the JSA (from Earth-2) got together for their annual team-up, Firestorm was sure to jump at the chance to flirt with Power Girl. As the youngest members of each team, it’s understandable why they connected. However, living in separate universes put a bit of a strain on their amorous activities. While Power Girl and Firestorm didn’t end up together in this story, you can sense romance is in the air between the two. 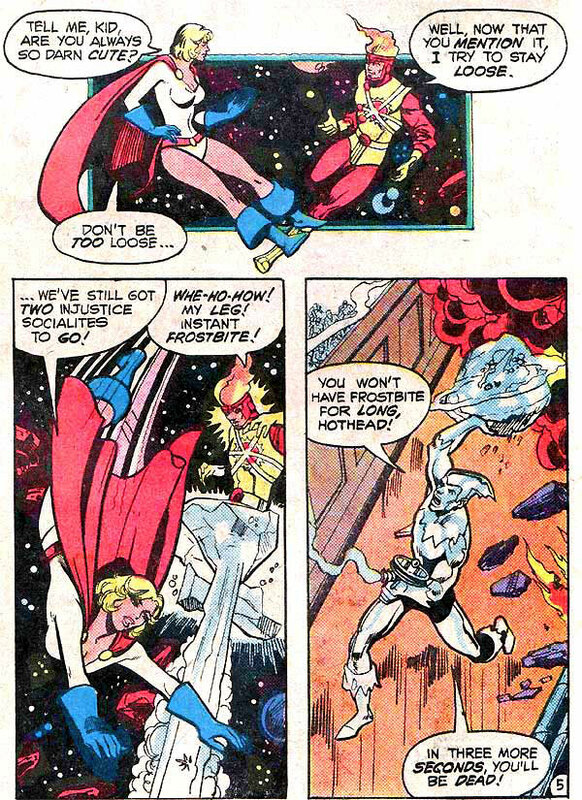 The next time Firestorm and Power Girl met was during Justice League of America #195-197 (Oct. – Dec. 1981). This time around she shot him down pretty fast. Poor guy. Below is a panel from that story written by Gerry Conway and drawn by George Perez and John Beatty. What the heck kind of pick up line is that anyway, Ronnie?!?! No wonder she shot you down cold. Next up was Justice League of America #207-209 (Oct. – Dec. 1982). “Crisis on Earth-Prime” was a massive crossover between the JLA, the JSA, and the All-Star Squadron. 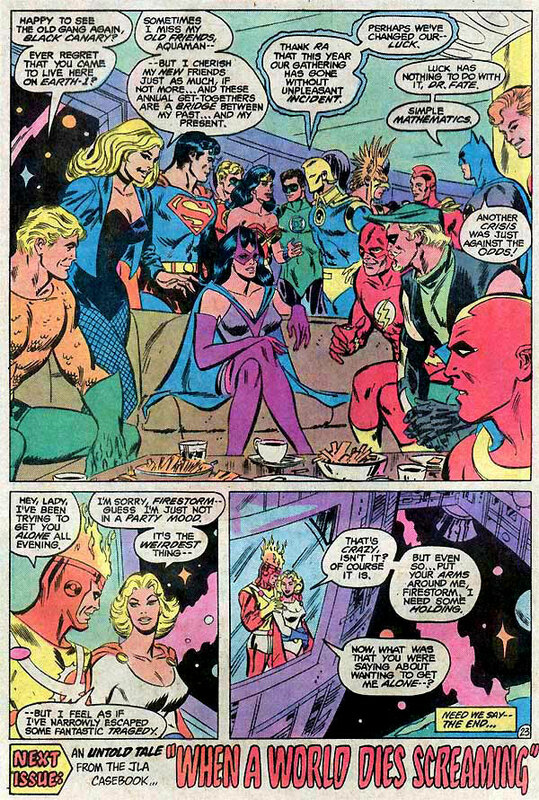 This event was so large it spilled over into All-Star Squadron #14-15 (Oct. – Nov. 1982). Below are some panels from the JLA issues written by Gerry Conway and drawn by Don Heck. This time around Firestorm finally gets the girl! Way to go hot-head! Way to go Firestorm! I wonder how the next scene went. Did Professor Stein politely turn his floating head around to give them some privacy? 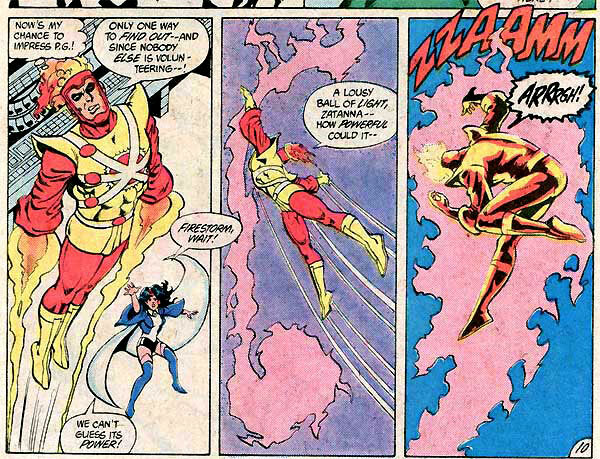 Firestorm and Power Girl next saw each other a year later in Justice League of America #219-220 (Oct. – Nov. 1983). 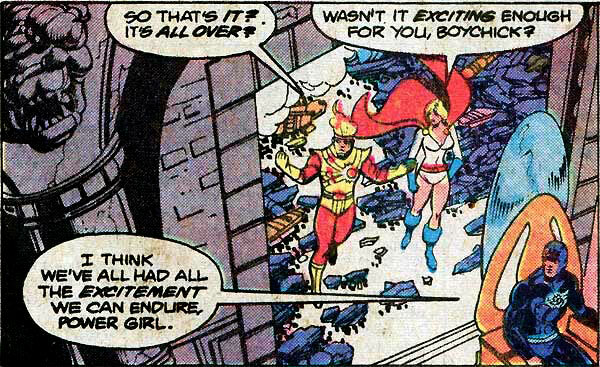 Now Firestorm being a bonehead in the romance department hadn’t bothered to call Power Girl during the past year. Just imagine, you hook-up with one of the hottest women in the Multiverse and you don’t call her for a year!?!? What an idiot. Thankfully Elongated Man, Zatanna, and Hourman were willing to give our Nuclear Dork some advice in matters of the heart. Below are some panels from that story written by Roy Thomas & Gerry Conway and drawn by Chuck Patton & Romeo Tanghal. Well… he got knocked unconscious trying to impress Power Girl, but he could have ended up in worse places than leaning against her chest. Too bad he slept through it. While Firestorm and Power Girl appeared in other scenes and stories together, those really cover the ones with romantic undertones. Two years later Crisis on Infinite Earths came along and wiped out the whole Multiverse. After that Firestorm and Power Girl existed on the same Earth, but they never really connected again romantically. 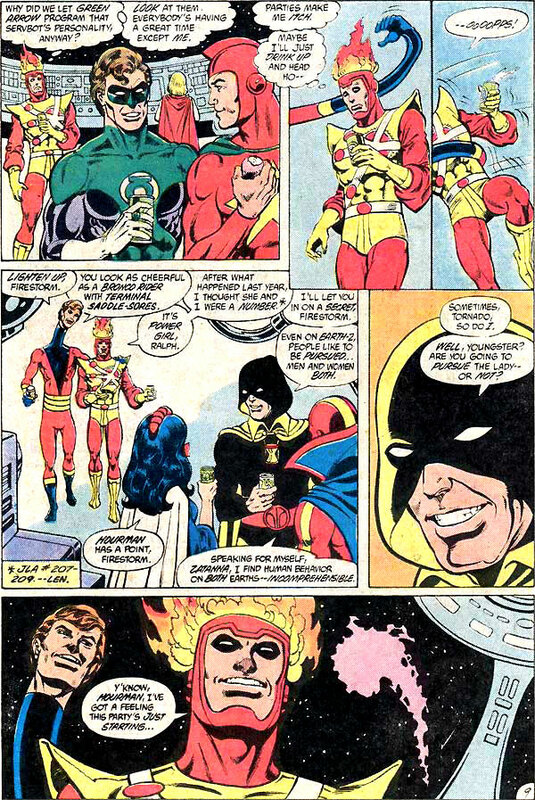 They did spend some time together during the Invasion event a few years later while Firestorm was in his “Blank Slate” incarnation. At first she seemed bothered when he gave her the cold shoulder, but when he eventually started flirting with her it was awkward and not reciprocated. The “Blank Slate” Firestorm was not known as a ladies man, that’s for sure. I recently had the opportunity to ask Gerry Conway what were his long-range plans for Firestorm and Power Girl back when he was writing JLA. He said it made sense there would be a natural affinity between the two characters as each was the youngest member of their respective teams. He went on to say that given Ronnie’s other romantic interests (i.e. Firehawk and Doreen Day), it probably wouldn’t have gone much further with Power Girl. Suppose you had to choose between Doreen Day and Power Girl… not really much of a choice, is it? Nowadays Ronnie Raymond is part of Firestorm again and Power Girl is a major player in the DC Universe. Who knows, perhaps some sparks could fly between these heroes once again. I’m not counting on it, but it would be fun to read! Posted in: Comic books, Firestorm #01: Original (Ronnie/Martin), Firestorm #02: Blank Slate (Ron/Mikhail/Stein), George Perez, Gerry Conway, Justice League of America, Ronnie Raymond. What’s odd to me is that, at least recenly, Power Girl has been pushed as being older and Firestorm is being pushed to be younger! I’m still trying to figure out why Ronnie came back as a frat guy and not as the guy we saw in Power Company, for instance (well, besides the obvious). Doreen Day. . .Firehawk. . .Power Girl. . . So a fella just needed some puffy sleeves and a flaming noggin? Who knew? I’m with Luke in questioning the decision of bringing back Ronnie as a party animal. I think any competent writer could still find plenty of adversity between Ronnie and Jason without degrading Ronnie’s character. Of course, Brightest Day isn’t over yet, so there may be more to Ronnie than we’ve seen yet. It used to be common to sprinkle everyone’s dialog with Yiddish but only Bendis keeps that tradition alive now. Anyhoo, super-fun. Was not aware of this! Fun! Ronnie and Power Girl nowadays would be a little like Demi and Ashton. The more I think about Ronnie’s actions in Brightest Day, the more I think Ronnie’s behavior is temporary. While he’ll remain somewhat irresponsible, I think he’ll cut out the partying and drinking. I believe he’s trying to drown out the mental anguish he’s feeling over dying and what the Black Lantern did in his place. Just my current thought process. Great summation of this almost romance. I always wondered why Ronnie didn’t just look up the PG on his Earth, Supergirl. Granted they were different in key ways but maybe something might have developed? 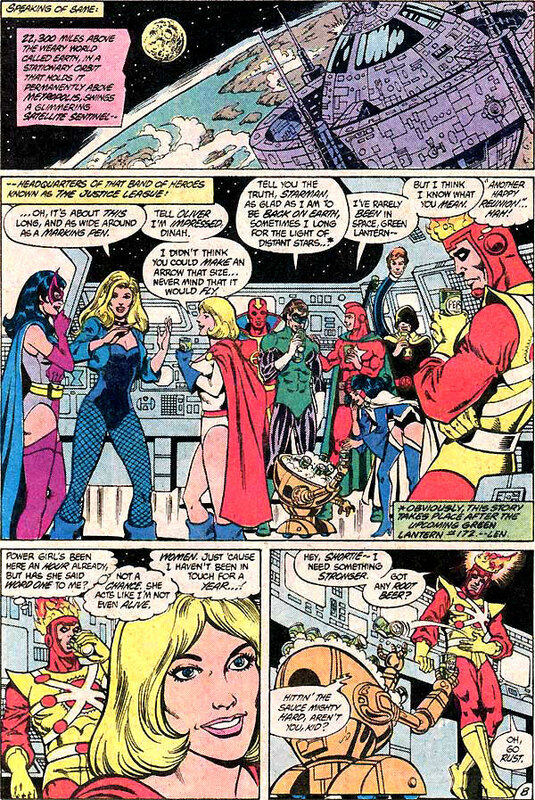 When Supergirl visited Earth-Two just before the Crisis with the Justice League, folks confused her with Power Girl so they at least looked similar. Leave a Reply to rob!